The bovine colostrum in Upgraded Whey is an impeccable pasture-raised colostrum that has not been damaged by heat or processing. Because of this high quality processing, the integrity of our colostrum is powerful and packed with nutritional vitamins, minerals, enzymes, amino acids, and antioxidant properties. The unique components of our colostrum support growth, tissue rebuilding and repair, muscle building, and overall lean body mass. These same components are also known to help support and strengthen the immune system. Grass-fed cattle are healthier, stronger, and consume a more nutritious diet than grain-fed. They contain more immune stimulating compounds, which supports optimal health. Upgraded Whey is more nutritious than regular whey, adding an easily digestible source of protein to your dietary intake. 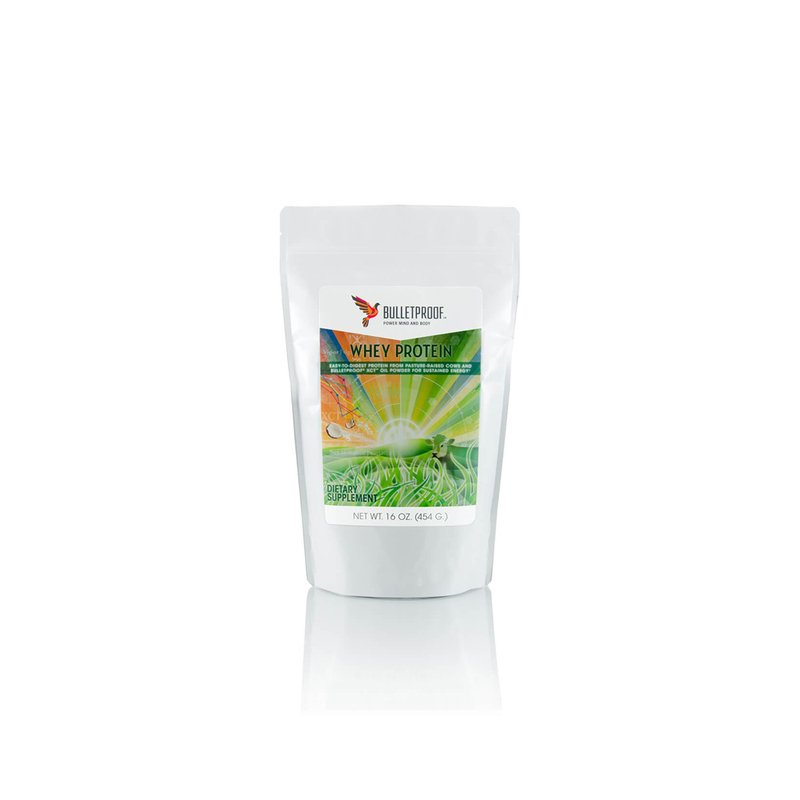 Enjoy this extra boost of nutrients and growth factor to improve peak performance. Upgraded Whey does not contain high fructose corn syrup, artificial sweeteners, flavors, dyes, or colorings. It is clean, odorless, and tastes great with our lab-tested VanillaMax and Upgraded Chocolate Powder. Whey concentrate, bovine colostrum, caprylic and capric acid triglycerides from highly refined coconut and/or palm kernel oil, tapioca dextrin, tapioca. 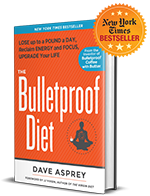 Bulletproof Whey is awesome! Love the way it tastes and mixes with my smoothies! GREAT TASTING WHEY. EASY MIXABILITY. Great tasting whey. Easy mixability. Quality second to none. The added MCT and Colostrum make this easily the best whey protein powder on the market. This product is excellent, I feel full and energized, no hunger, no crashes, the perfect thing to get sugar and carb cravings out of your life. The only whey protein my digestion can tolerate. Having been diagnosed with tortuous colon, I’ve had to find a way to add protein that does not bind me up. Thank you too on your BulletProof coffee & MCT oil. Absolute life saver. Non toxic and get things moving. Thank you for what you do. 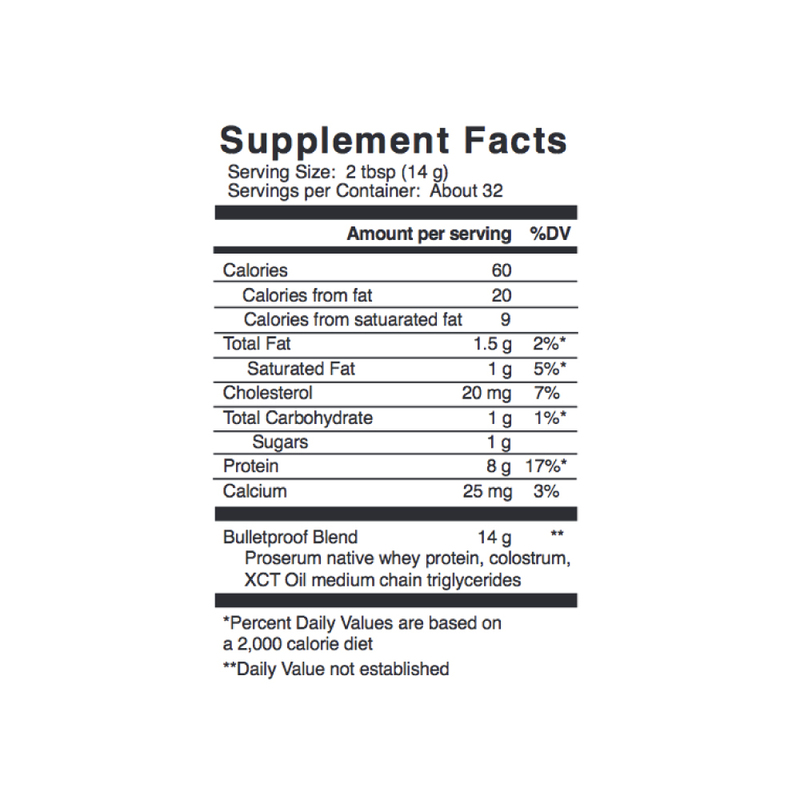 The Bulletproof Upgraded Whey Protein is excellent! Absolutely worth a try. IF YOU ONLY BUY ONE PRODUCT FROM UPGRADED SELF, THE UPGRADED WHEY SHOULD BE IT. This is the best whey protein powder I have ever had. You can immediately tell by the great flavor that it is an excellent product, but the long term effects on overall health, performance and appearance are unbelievable. I am a 27 year old female, full time student, and I use this product daily. It is great as a supplement after lunch or dinner, when I don’t have time to prepare much more than eggs and veggies, and I really feel a difference when I don’t use it (takes me longer to feel satisfied, less energy). The price is high so I have shopped around looking for other grass fed whey protein, but every time I have tried an alternative product I have been seriously disappointed, and experienced negative side effects either immediately (bad taste, bad texture) or hours later (bloating, discomfort). I cannot recommend this whey protein enough! I really like this whey protein. It mixes well with my berries and collagen to make and delicious tasting protein shake. It tastes clean and far better tan so man I have tried in the past. Highly recommended. I use this in my smoothie – every day. I blend it in the morning and put it in a shaker cup and have it around lunch time. It is the creamiest whey around! I found the Bulletproof Whey product to be a perfect addition for creating a post work out smoothie. Great texture and mixes well in a blender with water, banana and fruits, etc. Has a very pleasant, rounded, smooth flavor. Highly recommended!